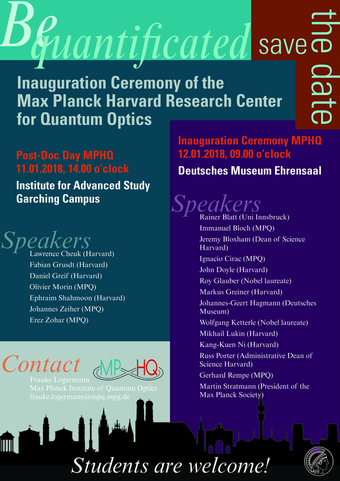 We would like to cordially invite all students to the official inauguration ceremony of our newly established “Max Planck Harvard Research Center for Quantum Optics (MPHQ)”, taking place on the 11th and 12th of January 2018 in Munich, Germany. 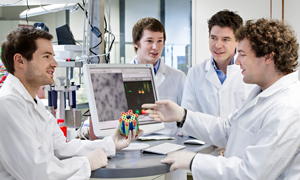 Please find the program of our inauguration ceremony here (pdf). The inauguration ceremony is planned as a two-day event, taking place at the Institute of Advanced Study on the 11th of January 2018. The official opening ceremony with high profile researchers and nobel laureates will be taking place at the Deutsche Museum on the 12th of January 2018. Below you find a short extract from our program. The event is open to the public and the participation of students is highly encouraged! 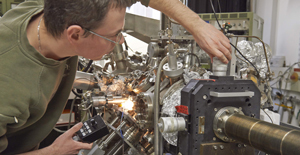 The Max Planck Research Center for Quantum Optics aims for becoming one of the major internationally recognized scientific collaborations of its kind in the field of Quantum Optics. We are looking forward to welcoming you at our inauguration ceremony.